The Queen of the Mountains, Sapa sits regally overlooking a beautiful valley, lofty mountains towering over the town on all sides. Welcome to the destination in northwest Vietnam, gateway to another world of mysterious minority cultures and luscious landscapes. The spectacular scenery that surrounds Sapa includes cascading rice terraces that spill down the mountains like a patchwork quilt. The mountains are often shrouded in mist that rolls back and forth along the peaks, offering tantalising glimpses of what lies in wait on a clear day. The valleys and villages around Sapa are home to a host of hill-tribe people who wander in to town to buy, sell and trade. In a beautiful valley close to the Chinese border, Sapa is a former hill station built in 1922. History has not always been kind to Sapa. and the series of conflicts that swept over Vietnam nearly saw it wiped off the map. From WWII, successive wars against the French and the USA, not forgetting the more recent border skirmish with China in 1979, took their toll. The old hotels built by the French were allowed to fall into disrepair and Sapa was forgotten by all but a handful of residents. With the advent of tourism, Sapa has experienced a renaissance. Bad roads have been upgraded, many streets have been given names, countless new hotels have popped up, the electricity supply is reliable and the food has improved immeasurably. Inherent in all of this prosperity is cultural change for the Montagnards, many of whom are now well versed in the ways of the cash economy and are reaping the financial rewards of the tourism influx. The downside is a building boom that has seen one hotel after another raise the roof in a continual quest for better views. Height restrictions are rarely enforced and the Sapa skyline is changing for the worse. Another inconvenience that will not change is the weather. If you visit off-season, don't forget your winter woollies. Not only is it cold (like 0°C), but winter brings fog and drizzle. Quite why the French alighted on this spot is difficult to comprehend: it must have been one of those rare clear days when the views are to die for. The chilly climate does have its ad vantages, however. The area boasts temperate zone fruit trees bearing peaches and plums, and gardens for raising medicinal herbs. The dry season in Sapa lasts from around January to June. January and February arc the coldest (and foggiest) months. From March to May the weather is often excellent, and the summer is warm despite the rains between June and August. The window from September to mid-December is a rewarding time to be in Sapa, though there is a bit of lingering rain at the start and the temperature dips by December. Sapa would be of considerably less interest without the H’mong and Dzao people, the largest ethnic groups in the region. The billowing red headdresses of the Red Dzao are visible all over town, a surreal sight amid the accelerating development. The H'mong are more numerous and canny traders. Their villages may look medieval but most ,will have a mobile phone and an email address to stay in touch. Traditionally, they were the poorest of the poor, hut have rapidly learnt the spirit of free enterprise. Most of the Montagnards have had little formal education and are illiterate, yet all the youngsters have a good command of English, French and a handful of other languages. If possible, try to visit during the week, when Sapa is less crowded and more intimate. Crowds flock to Sapa for the Saturday market, but a smaller market is held every day There is plenty to see on weekdays, and there are lots of interesting villages within walking distance of the centre. Sights & Activities: The easiest trek in town is to follow the step’s up to the Sapa radio tower for killer views of the valley. 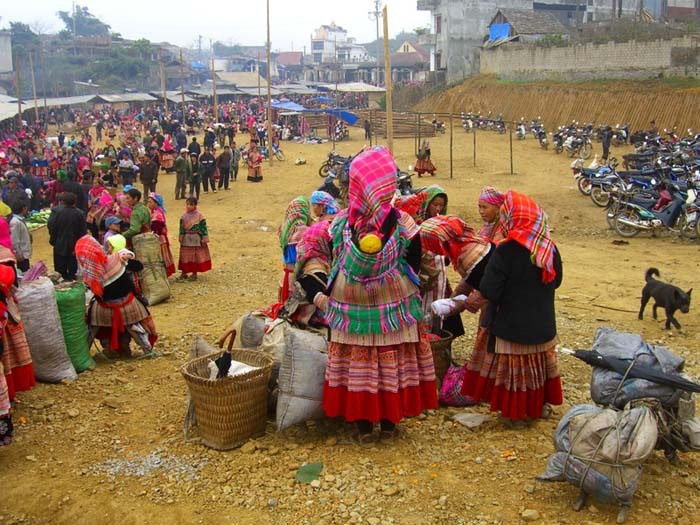 Montagnards from surrounding villages don their best clothes and go to the Sapa market most days. Saturday is the busiest day, and the town is choking with tourists as the evening "love market" is a big magnet for organised tour groups from Hanoi. If you'd rather enjoy Sapa at a more sedate pace, avoid the Saturday market. The love market is speed dating minority style. Tribal teenagers trek into town to find a mate. It's all very coy, but unlike many of the more remote love markets in the region, it has become very commercial in recent years, These days there are more camera-toting tourists than love-sick Montagnards, as well as a smattering of opportunist prostitutes on the scene. It is quite easy to undertake day hikes through the valleys around Sapa without the assistance of a guide. However, for overnight stays in villages and longer treks into the mountains, it is advisable to hook up with a local guide. Where possible we suggest the use of minority guides, as this offers a means of making a living. There are endless options for trekking. Pick up a decent map and plot your course. The villages and the surrounding landscape are now part of Hoang Lien National Park. The nearest village within walking distance is Cat Cat (admission 5000d), 3km south of Sapa. Like everywhere in this area, it's a steep and very beautiful hike down; if you're too exhausted or unfit to hike back up, there are plenty of xe om ready and willing to car you back to your hotel. Another popular hike is to Ta Phin village (admission 5000d), home to Red Dzao and about 10km from Sapa. Most people take a xe om to a starting point about 8km from Sapa and then make a 14km loop through the area, passing through Black H'mong and Red Dzao villages. Surrounding Sapa are the Hoang Lien Mountains, nicknamed the Tonkinese Alps by the French. These mountains include Fansipan, which at 3143m is Vietnam's highest peak. The summit towers above Sapa, although it is often obscured by clouds and is occasionally dusted with snow. The peak is accessible all year to those in good shape and properly equipped, but don't underestimate the chal-lenge. It is very wet, and can be perilously slippery and generally cold, so you must be prepared. Do not attempt an ascent if the weather is terrible in Sapa, as limited visibility on Fansipan could be treacherous. The summit of Fansipan is 19km from Sapa and can be reached only on foot. The terrain is rough and adverse weather is frequent. Despite the short distance, the round trip usually takes three days; some very fit and experienced hikers do it in two days, but this is rare. After the first morning you won't see any villages: just the forest, striking mountain vistas and perhaps some local wildlife such as monkeys, mountain goats and birds. No ropes or technical climbing skills are needed, just endurance. There are no mountain huts or other facilities along the way (yet), so you need to be self-sufficient. This means taking a sleeping bag, waterproof lent, food, stove, raincoat or poncho, compass and other miscellaneous survival gear. Hiring a reputable guide is vital and, unless you arc a seriously experienced mountaineer, find ing porters who will carry your gear is also strongly recommended. Weather-wise the best time for making the ascent is from mid-October to mid-December, and again in March, when wildflowers are in bloom. The incredible road between Sapa and Lai Chau crosses the Tram Ton Pass on the northern side of Fansipan, 15km from Sapa. At 1900m this is the highest mountain pass in Vietnam. Even if you are not planning to carry on around the northwest, it is well worth coming up here to experience the incredible views from the top of this pass. Descend by mountain bike before returning by truck or rent a motorbike to make the short hop to the new Tam Duong (Binh Lu). This is a seriously spectacular ride. On the Sapa side of the mountain the weather is often cold. foggy and generally miserable. Drop down a few hundred metres below the pass on the Lai Chau side and it will often be sunny and warm. Ferocious winds come ripping over the pass, which is not surprising given the temperature differences - Sapa is the coldest place in Vietnam while Lai Chau is the warmest. Tram Ton Pass is the dividing line between two great weather fronts - who says you can't see air? Alongside the road, about 5km towards Sapa. is Thac Bac (the. Silver Waterfall). With a height of 100m, it's a big one, and the loop track (admission 3000d) is steep and scenic. Long touted as the weekend alternative to Sapa, this small highland town doesn't have the same dramatic location of its more illustrious neighbour, butl it is calmer when Saturday comes. It fills up to choking point on Sunday morning, when visitors flood in to meet the Flower H'mong at the morning market. Compared with Sapa, tourism is still in its infancy here and during the week the town has a deserted feel. Bac Ha is a good base to explore the surrounding highlands. Around 900m above sea level, it is noticeably warmer than Sapa. There are 10 Montagnard groups that live around Bac Ha; the colouful Flower H'mong are the most visible, hut other groups include Dzao, Giay (Nhang), Han (Hoa), Xa Fang, Lachi, Nung, Phula, Thai and Thulao. One of Bac Ha's main industries is she manufacture of alcoholic home brews (rice wine, cassava wine and corn liquor). The corn hooch produced by the Flower H’mong is so potent it can ignite! Bac Ha is the only place in Vietnam where you'll find this particular moonshine; there's an entire area devoted to it at the Sunday market. Swill some down before deciding whether to buy a buffalo or cow. This Tuesday market is about 35km if from Bac Ha.You can net here via a fairly good road, or by road and river; hotels in Sapa and Bac 'la can organise trips. Villages around Bac Ha provide an opportunity to see how Montagnard people live. Ban Pho is nearest, and the villagers live simply The Flower H'mong villagers are so hospitable - some of the kindest people you'll meet in Vietnam. Ban Pho is a 7km return trip from Bac Ha. Take a loop route to get there and back. Other nearby villages include: Trieu Cai, an 8km return walk; Na Ang, a 6km teturn walk; and Na Hoi,a 4km return walk.Ask at your hotel for directions.